I have been watching West Ham for almost sixty years now, and when I go along to a game I hope for a West Ham win, a convincing performance, an entertaining game, a clean sheet, good conversation with fellow supporters, and a trouble-free journey both to and from the game. On Monday evening I saw a West Ham win, a very good performance, albeit not totally convincing, decent entertainment, good conversation, and a trouble-free journey to the game. I won’t dwell too much on the return journey other than the fact that two significant road closures meant that I didn’t arrive home until almost 2am, when I would have been in before midnight without the M11 and A12 being totally closed off for road works at important junctions, with no advance warning that I was aware of. My blog colleague, Geoff Hopkins, wrote an excellent review of the game and I couldn’t add much to his article. In my view, by West Ham standards in recent times I felt that some of our movement and passing was slick, and I also felt that our organisation and set up was good, and appropriate for the opponents we faced. I liked the way the defence worked as a unit. Fonte and Zabaleta combined well on the right, as did Collins and Cresswell on the left. Reid was almost an old-fashioned sweeper, mopping up. Zabaleta and Cresswell went forward well to provide width on the flanks, as we had five defenders without the ball, but reverted to three when we were in possession. If only Kouyate had managed to get on the end of Carroll’s splendid cross in the first couple of minutes, or if Chicarito’s shot against the bar had been inches lower, then an early goal might have set us on our way to a more convincing victory. As it was we needed a lucky break for the opening goal, but it was certainly well deserved. Huddersfield were well organised defensively and came looking to stifle us, but they lacked adventure and flair going forward, and I believe they got what they deserved from the game, which was absolutely nothing. 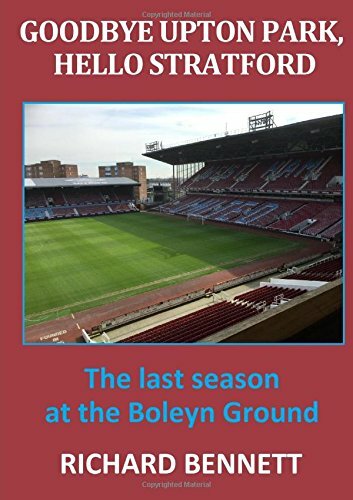 Anybody who has read this blog in the last couple of seasons, or who may have read my articles in Over Land and Sea, or in my book Goodbye Upton Park, Hello Stratford which covered the final season at Upton Park, will know that I am not a fan of West Bromwich Albion. The majority of our fans will, of course, put forward Tottenham as the team that they most dislike, and I don’t particularly care for them either, but when I consider which teams I just wouldn’t want to watch because of the way that they play football, then the Baggies top my list, having taken over the mantle from Stoke in recent seasons. The common denominator is, of course, their manager Tony Pulis. For me, there is so much to dislike about his approach to the game, and how his teams are set up, although I cannot argue with the effectiveness and results that are obtained. I watched a little of the televised West Brom v Stoke game earlier this season, but turned it off to go and watch some paint drying which was much more entertaining. Last season was a particularly effective one for them, as they remained in the top half of the table almost throughout. In fact they were clear in eighth place for much of the second half, but had a disastrous run-in with seven defeats and a draw in their final eight games which relegated them to tenth, one place above, and level on points with us, but with a superior goal difference. They lost all of their four final home games of the season without managing to score a goal, losing every one of them to a single strike. In fact they failed to score a single goal in eight of their final twelve games of the season, their solitary victory in these dozen games being a 3-1 win over Arsenal. This season began well for them results-wise with a (predictable?) 1-0 home win against Bournemouth, followed by another 1-0 win at Turf Moor. They were then held 1-1 by Stoke in their third game, before losing their unbeaten record in a 1-3 reverse at Brighton last weekend. From their viewpoint they have put an end to their failure to score at the end of last season, by finding the net once in each game. And seven points from four games puts them in the top half of the table once again, in ninth place. Our manager has some interesting decisions to make in respect of team selection this weekend. I assumed that Lanzini, Fernandes and Noble would be fit, but this is apparently not the case. But of course Arnautavic has served his suspension for his lunacy at Southampton, and will therefore be pressing for a place in the starting line-up. The future dilemma for the manager will be how he can possibly fit players like Lanzini and Arnautavic back into the side to add much-needed creativity, whilst at the same time not losing out on the solidity in a defensive sense that was so evident in the Huddersfield game. Ayew’s contribution from the bench last Monday was an important, albeit surprisingly good one, and he will be hoping for his name on the team sheet today, too. I have no idea what Mr. Bilic will decide to do, but personally, for the West Brom match I would retain the same team that started against Huddersfield, with Arnautavic and Ayew sitting eagerly on the bench waiting to enter the fray if we fall behind. I can see West Brom keeping up their record of scoring one goal in every game, and the question remains for me, will we manage to score one or even more goals? I’m hoping that we avoid complacency after our first win of the season on Monday. We need to watch for West Brom on set pieces as they are possibly the tallest side in the league, and try to use this to their advantage. Providing we can nullify this threat I can see us winning our first away game of the season by the odd goal in three.